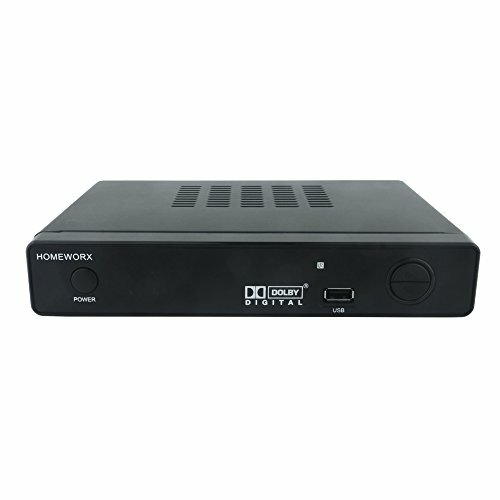 Mediasonic HOMEWORX HW-150PVR is a digital converter box which converts Over-The-Air ATSC digital broadcast to your analog and digital TV. The built-in Media Player function allows user to play back picture and video files via USB connection. The built-in recording function allows user to record their TV programs and play back. Please Note: this converter box is designed to receive Over-The-Air signal, and it is not a replacement of cable box. External Antenna is required to connect to this converter box in order to receive signal. This Certified Refurbished product is tested and certified to look and work like new. The refurbishing process includes functionality testing, basic cleaning, inspection, and repackaging. The product ships with all relevant accessories, a 1-Year warranty, and may arrive in a generic box. Only select sellers who maintain a high performance bar may offer Certified Refurbished product on Amazon.com. It is packaged in either white box or original color box. Receive Over-The-Air Digital Broadcast to your Analog and Digital TV, Projector, and Computer Monitor. Antenna Out Analog Pass Through, Favorite Channel List, Parental Control Function, USB Multimedia Player Function. Auto Tuning, HDMI 1080P Output / Composite Out / Coaxial Output, Closed Caption, Real-Time recording & Programmed Time Recording, Auto, 16:9 Pillar Box, 16:9 Pan G Scan, 4:3 Letter Box, 4:3 Pan G Scan, 4:3 Full, 16:9 Wide Screen. Timing Start Up & Shut Down.